One of the great challenges facing all who work in the interreligious domain is the relationship between what we say to others, as we engage them in dialogue, and the teaching we offer to the members of our own religious traditions. Often, there is a discrepancy between inside and outside talk. Those who work in the field of interreligious relations are also deeply aware of the challenges that interreligious work poses to our own views of other religions. Thus, alongside work in interreligious relations and dialogue, there has developed the field known in the academy as Theology of Religions. Theology of Religions examines how a given religious tradition views other religions. In the contemporary context this is often accompanied by a reassessment of prevailing views, often bringing to light resources that exist within the traditions, that have been forgotten or overlooked, due to political and historical circumstances. One of most important projects of The Elijah Interfaith Academy (the branch of the Elijah Interfaith Institute engaged in research and reflection) has been the development of contemporary theologies of world religions. 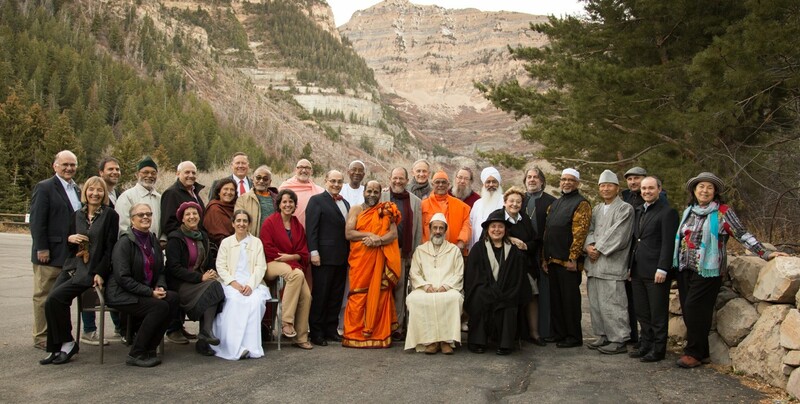 Unlike other projects, that bring together scholars and thinkers of diverse religious traditions, to address pressing issues in common, this project brings together thinkers, scholars and educators of an individual tradition, in order to reflect together about issues relating to their own religions views of other religions. Elijah would like to stimulate conversations of this nature within each of the religious traditions represented at Elijah. The past month saw two important initiatives related to Judaism and Islam. We are happy to share news of these projects with you. Several months ago Elijah received a major grant from the Rockefeller Brothers Fund to engage in a multi-year reflection process on this topic. 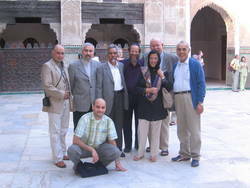 The project is directed by Prof. Vincent Cornell (pictured below with fellow meeting participants), a leading Muslim theologian, formerly director of the King Fahd Center at the University of Arkansas and presently Asa Griggs Candler Professor at Emory University. At the end of May the projects inaugural conference took place in Ifrane, Morocco, at Al Akhawayn University. The meeting was attended by around 20 participants from all over the Muslim world. Participants hailed from Egypt, Malaysia, Turkey, Pakistan, Morocco, UK, Cameroon, Iran, Iraq and the US. This allowed the discussion to take on a truly international character, offering a balanced and representative view of Islam, seen in a truly global perspective. The meetings proceedings were followed by interest by the minister of religious affairs of Morocco, Dr. Ahmed Toufiq, as well as by representatives of ISESCO, and faculty at Al Akhawayn University. The meeting had three goals, all of which were successfully met. A. A broad community of scholars was created, to carry forth the project. There was a sense of excitement, enthusiasm, novelty and great importance attached to this project. Participants in the conference constituted themselves as a community of research and reflection, ready to take the project forward. B. A conceptual framework, that had been previously suggested by an academic executive committee, was affirmed and accepted as the working basis for the project. The conceptual framework recognizes nine areas of thought that require further attention over coming years, as part of developing a contemporary Muslim theology of world religions. These areas, and the issues they seek to address, are listed below in the Sharing Wisdom section. C. Finally, a multi-year research cycle has been put into place, with participants breaking into small research groups that will systematically examine these topics over the coming years. Scroll down to Sharing Wisdom to read more about the meeting’s conceptual framework. 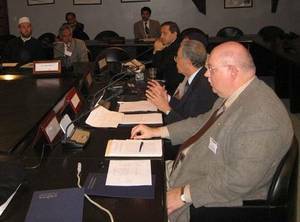 The inaugural conference of the Jewish track of this project was held at the University of Scranton in 2005. Various followup initiatives have grown out of that conference. One of them involved a series of educational activities carried out at and around Yeshiva Chovevei Torah, a modern Orthodox seminary in New York. These programs were carried out through a grant of the Henry Luce Foundation. The core of the program was an intensive seminar focusing on attitudes to Christianity and to world religions, in light of the writings of the 18th century Rabbi, Jacob of Emden. This pioneer of wisdom-based tolerance and appreciation of other world religions provides an important starting point for a restatement of contemporary Jewish views of other religions. Key questions, such as the limits of contemporary tolerance, the Jewish study of the New Testament, and the ways in which one religious tradition may legitimately interpret another tradition in its own terms were explored with seminarians by Alon Goshen-Gottstein, with the help of guest lecturers, including Professors David Berger, Alan Segal and Mary Boys, as well as writer and journalist Yossi Klein Halevy. Additional educational activities grew out of this course. These included an inter seminary study program, that brought together seminarians from Yeshiva Chovevei Torah with students of the Reconstructionist Rabbinical College to explore diverse understandings of idolatry, as well as community based lectures at the Hebrew Institute of Riverdale. The success and enthusiasm of these programs will find continuity in additional programs planned for the coming year at both seminaries, as well as additional rabbinical seminaries in the New York area. This work brings Elijah back to its historical institutional roots, serving seminarians through the Elijah School for the Study of Wisdom in World Religions. The following nine programmatic areas were at the focus of the Ifrane conference, and constitute the working plan for the coming years of the Towards a Contemporary Muslim Theology of World Religions project. Their relevance may extend from the Muslim case, under discussion, to other religious traditions, working through similar issues. This issue hold the key to a new hermeneutics. Can reason be the middle ground in interpretation, considering Gods word and the traditions of the Prophet It also holds an important key to the acceptance of the religious legitimacy of the other, and to the others ability to make independent choices with regard to truth. Much recent Sharia discourse has been dominated by the suppression of reason, unlike what we find in the Quran and in the historical tradition of Islam. The balance of reason and revelation touches upon the very sources and legitimacy of religious authority. The crucial question of the place of ijtihad is related to this issue. The role of practice as bridging Reason and Scripture. The sources of authority of the state play into broader issues of recognition of the other and of participation of Muslims in other forms of culture and governance. Issues of authority in relation to other religious groups appeal to notions of sovereignty. The question of divine vs. human sovereignty affects our attitude to state bodies. The question of the ideal and just state plays into the very goals of religion and the ability to practice it, again having implications for how Islam interacts with forms of government, in the Muslim world and outside it. Is the state living up to its obligations to religious minorities and does it corrupt the view of other religions Issues of the status of minority religious groups within modern states, both Muslim and non-Muslim are also relevant, as is the question of Shari’a adherence and loyalty in secular states based on a notion of social contract. Ways in which the Law has become the central issue in approaches to Islamic reform. Methods of legislation in relation to other groups. Broad range of law-related issues that are impacting Islam in general. Notion of rights of different groups within Muslim society and of Muslims within non-Muslim societies. Including right to dissent and right for religious dissent, both within Islam and beyond it. Assessment of situation of contemporary Islam in terms of power and justice. The scope of divine justice as a yardstick for judging other traditions. This issue conditions many contemporary situations in which Muslims are embroiled in conflict with others. Are relations between communities based on power or on universal laws Viewing Islam in colonial and post-colonial settings. Impacts upon Islam of sense of new wave of Western hegemony, as manifested in a variety of contemporary political situations. Understanding theological questions of theodicy and justice in Islam. Justice and power are the praxis issues related to the theoretical attitude of Muslims toward others. Also related are issues of oppression within Muslim world, limitations on media, etc. How far is the Umma universal and and what does this mean for religious dissent Do different monotheistic religions worship the "same" God Is Islam part of broader phenomenon of religion and does it share roots with others, or is it isolated and unique The nature of universal knowledge vs. Islamic knowledge. How does the image of oneself as a Muslim affect one’s approach to the religious other Role of difference or similarity when comparing religious perspectives. Concept of the kafir (rejecter of Islam) as unbeliever. Relationship between theological difference and moral judgment. Problem of proper knowledge of others. Distortion in image of Muslims in world. Education within Muslim society. Knowledge of earlier sources. Recovery of older positions accepting of diversity that have been lost. Dealing with harmful and problematic attitudes.